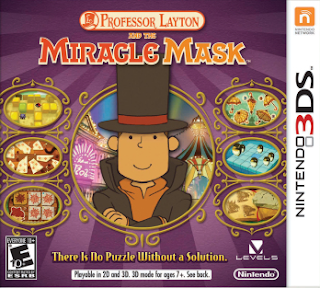 Seeing as how Level-5's first 3DS-based Professor Layton title is due to hit the streets throughout both Europe and North America in a few short weeks, I thought I should prepare and publish another "Which Box Art is Better?" post in its honor. 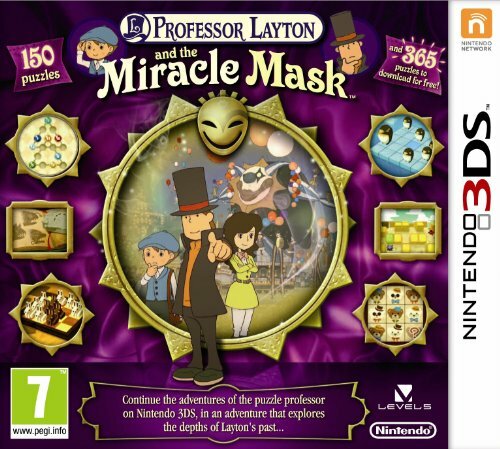 Before we get to its European and North American cover art, though, let's take a look at the art, below, that can be found on Japanese copies of the game (which was released all the way back in February 2011). At first glance, the title's North American cover art, below, looks pretty similar to that of its European counterpart, at least in terms of color and theme, but on closer inspection it manages to set itself apart thanks to a more elegant and less constricted design. As for which one I like best: I'm sure this will shock some of you more excitable folks, but this time around I'm going with the European box art. Yes, it's busier than a mosquito at a nudist colony, and I'd like it a lot more if it included even 50 percent less text, but I still prefer it to its two "competitors." For me, both the Japanese and North American cover designs are just a bit too ... sterile. (OK, so the Japanese design is way too sterile.) I consider the European design, on the other hand, to be dramatic and moody, plus it features the most appealing logo of the bunch. That's just my opinion of this box-art trio, though; what's yours? I like the japanese boxart. It looks cool but there are some colours missing. I'm shocked that you picked the European box art, what with al you've said about disliking text being crammed onto a box. I think it's WAY too busy...looks like a magazine ad and not a game box. I'm satisfied with the US version. The Japanese version is...umm...not quite finished yet? European box for me as for me it's the nicest, brightest and stands out the most. I like the Japanese style but don't quite like how it looks and the North American cover looks basic and faded to me. I hate to say this, but I feel like the European cover is a little bit, hm... "tacky"? It just doesn't feel as professional as the other two. Not that a game cover needs to be professional, really, but I agree with Justin that it looks more like a magazine ad than a game cover. The one in the middle. The top one is too sterile and the bottom one isn't dramatic enough without the guy pointing. Hey Bryan, have you seen this supercute Taiko no Tatsujin Trailer? Seriously, though, I agree with you that the NA cover art is pretty "meh." The DS games had much better cover art in this region, IMO. Oh, now you've gone and done it, Anne! Tacky? Actually, I can see why you'd say that. I don't really agree, but I can understand. Also, I'm with you 100% when it comes to the NA cover. NOA likes to do that kind of thing (capitalize all of the letters in a subtitle, etc.) and I have to say I really don't understand why. Hey there, IvaNEC! Where the heck have you been? Regardless, welcome back! Does this mean we'll be getting some more posts on your site soon? I hope so. Anyway, I agree with your assessment, of course. Thanks for sharing it! Maybe tacky was a bad word, but I actually prefer the NA version's logo! What is it you like about the EU logo? I actually like the coloring for its NA counterpart better, but I do like how Layton and Luke's faces are featured on either side! 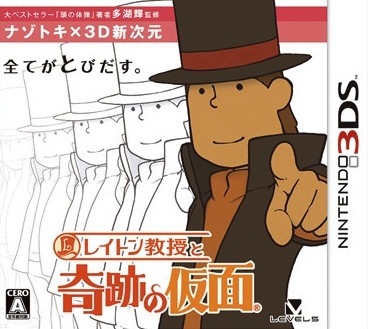 I meant to say I liked how Layton and Luke's faces feature in the *EU* logo. Whoops!